There are many ways to save money when you homeschool. One way is to join a support group where you will come into contact with many other homeschool families. Many of these families have on hand schoolbooks their children no longer use, and are more then happy to lend or give them away to help out other homeschooling families. Another option, at least in Maine, is the option of being able to contact the public schools or the department of education, and seeing what text books they have available for you to borrow. 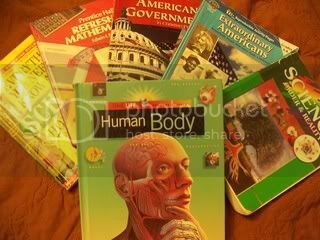 There is no cost to the homeschoolers, but many homeschool families do not take advantage of this option, because many want to get away from the text books the public schools use, opting to purchase their own books instead. The different homeschool organizations hold book fairs where vendors come in with tables and sell new and used books. Homeschool families also set up tables and sell the books they no longer have any use for as well. You can also pick up on many money saving tips at these functions. Some homeschool organizations also operate used book stores. In fact, for a small fee, they will help you chose all the books you will need for any school year, taking the guess work out of trying to figure out which books you should be using for any age group. Online is a great place to search out used text books. There are many online used book stores, many offering used text books for under $10, many are below $7. If you are new to homeschooling, I suggest you purchase the teachers edition, it will make life a whole lot easier. If your looking into homeschooling, or doing so and need help obtaining a free computer, there are plenty of free computers out there, you just need to know how to get one for free. Write letters to your electric company, your telephone company, local colleges, and even the local hospital. State in your letters that you homeschool your child/children, and can't afford a computer, and were wondering if they had a used one your children could have. This approach works because these businesses use a very large amount of computers, and often have a number of them in storage, and they like helping out people whenever they can. Local nonprofit organizations are also good at helping come up with a used computer. Over the years we have been given a free computer from a local business, one from a non-profit organization, one from a college, and one from the power company. Cut costs on printing by doing some of your copying at a local college. The one near us has a computer room that is open to the public, and you can spend hours a day on their computers for free. And any paperwork you download and copy is also free. We are lucky to also have a local bank that allows its customers to use their copy machine for free as well. Finding such places can save you a lot of money. Library book sales at a local public library are a great place to find used text books, and hardcovers usually sell for between $1 to $2 each, with soft covers selling for much less. These book sales usually take place in August around here. 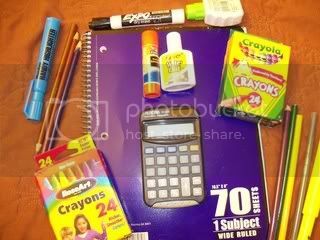 These are just a few money saving tips to help you save money on your school supplies. Make money on RedGage just like THIRDSTONE!